From the hall of the Selimiye Mosque complex. The Selimiye (built under sultan Selim II (1560-1574) is next to the Mevlana Museum complex. 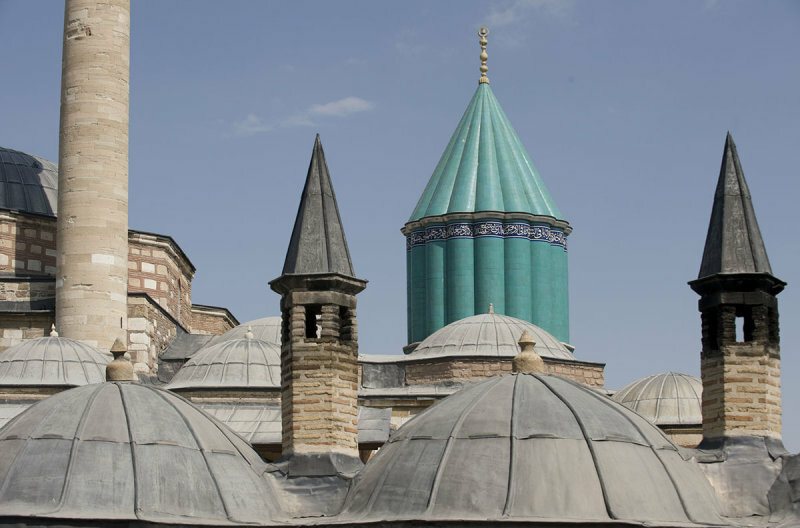 We see the roof of the "green Türbe", where Mevlana is buried. Close up it looks heavily restored, but its shape is still the same as when it was erected in the 15th century. The original Seljuk buildings of the Tekke of Mevlana have been rebuilt or altered. The appearance of all (except the Türbe/Mausoleum of Mevlana) belongs to the reigns of Süleyman I (1520-1566) and Selim II (1566-1574) in the main. Tekke = the largest kind of building (often a complex) designed specifically for gatherings of a Sufi brotherhood. It was a place for spiritual retreat and character reformation, and often served as hospices for Sufi travelers and Islamic students. From Wikipedia: Sufism is defined by some adherents as the inner, mystical dimension of Islam, others contend that it is a perennial philosophy of existence that pre-dates religion, the expression of which flowered within Islam. A practitioner of this tradition is generally known as a sufi. They belong to different "orders" - congregations formed around a master - which meet for spiritual sessions, in meeting places known as zawiyah (zaviye), khanqah or (for the larger ones) tekke. Sources: ‘Islamic Architecture: Ottoman Turkey’ (Godfrey Goodwin) – London 1977 & Wikipedia.